This event is SOLD OUT. 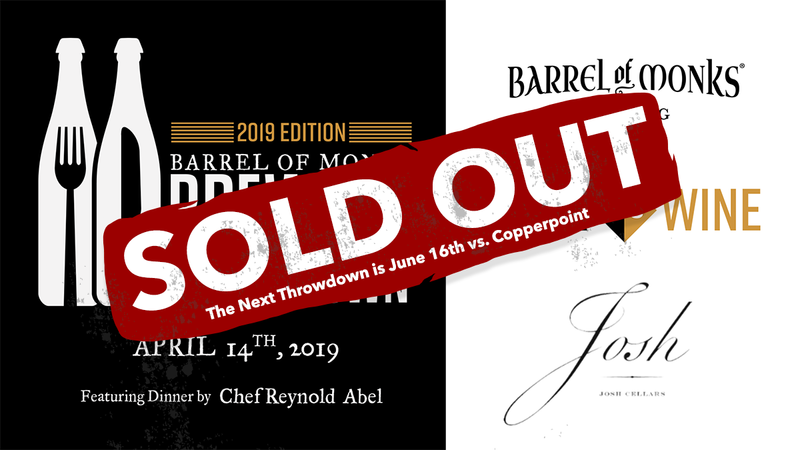 Our next throwdown is June 16th vs. Copperpoint Brewing. In a first-ever departure from beer pairings, we welcome Josh Cellars to the brewery for a twist on our traditional format. On Sunday, April 14th, we are facing off against these West Coast wines. Wine Vs. Beer. Old-World Vs. New School. Vine Vs. Stein. Let’s settle this! Noting Bordeaux and Burgundy wines as the influence for their bold flavor palate, Josh Cellars sources its grapes from the lush Napa and Sonoma regions, for a striking flavor and proper finish. Crafted with care, their wines balance character and approachability. Our event will feature 4 beers and 4 wines per person. We will pair these offerings with a 4-course dining menu created by Chef Reynold Abel.